Play this game the usual way: ask your students to stand up and follow your instructions. The trick is: your students should only carry out your instructions if you start with ‘Simon says..’. If a student makes a mistake, they are out of the game and sit down. Include the following instructions: Go to sleep! Wake up! You’re angry! You’re stressed! You’re in a hurry! Breathe! Relax! You’re happy! Note: You might need to demonstrate your instructions first. At the end, you can pose a Group Challenge: Are they able to recall all the instructions? Put them on the board as they call them out. You can indicate the number of instructions you gave. Next, students can also take the role of the teacher and you can have further rounds of ‘Simon Says’. You can help by eliciting, demonstrating different states, giving the initial letter to jog their memory. E.g. happy, sad, tired, relaxed, angry, afraid, cold, hot, stressed, lonely, peaceful, upset, disappointed, curious, excited, thoughtful, shy, confident. Tell your students that you will now watch a clip called ‘Mind in a Jar’. Ask them to predict 10 words that the clip will contain. Pause the clip after each unit of speech and ask your learners to hear the echo with their inner ears. This focuses their attention and increases retention. Stop the clip when you hear ‘Pick a colour of sand that feels right for your feelings and thoughts.’ Give them 5 seconds to focus on their thoughts and feelings, pick a colour and write it down. Then listen to their colour choices. Ask your students how they are feeling at the moment – give them a few seconds to direct their attention inwards and find an adjective that describes their present state. Then they do a Feelings Line-Up: they queue in alphabetical order telling others only the initial letter of their adjective. One by one, the group tries to guess everyone’s adjective. Students are encouraged to show their emotions with facial expressions and body language. Note: It’s OK for several students to choose the same adjective. It might be a good idea to ban ‘tired’; if it’s their first choice, ask them to go deeper into themselves. At the end, you can take 3 deep Group Breaths, and ask them to let go of any negative emotions. Check understanding of key vocabulary, language chunks. E.g. jar of water, mind, sand, thought, feeling, pick, breathe, observe, rest, meditate, settle, it feels right, to be in a hurry, feel stressed, feel angry, feel upset, bottom of the jar. Bring a jar with water, some coloured sand, spoon, and a bell and do the ‘experiment’. You can narrate the story as you go along, eliciting key words from the students. Suggested words to elicit are given in brackets. The jar of water is our (mind). And the different colours of sand are our (thoughts and feelings). What kind of thoughts do you have when (waking up)? Pick a colour of sand that feels right for your (feelings or thoughts). This is how our minds are when we’re in a hurry,( stressed, angry, or upset). Can you see things clearly in this (state)? 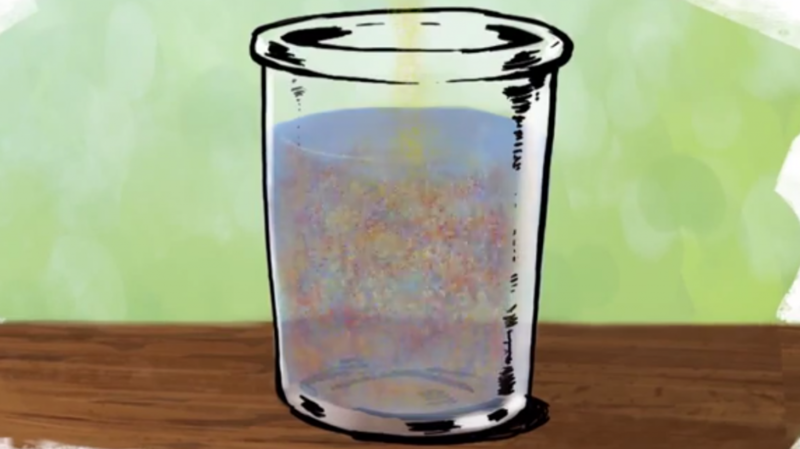 Let’s breathe with the (bell), and observe all the sand as it slowly settles (to the bottom of the jar). This is what happens to our mind when we (meditate). We’re mindful of our body and our (breathing). What is the water like (now)? The thoughts and feelings can still be there in our (minds), but rest peacefully at the (bottom) because we know how to return to our (breathing) to calm them. Play the video without sound and ask students to be the narrators. First they can just read the text. You can cut up the text (see above) into separate chunks, number them, and give them out to students. What are situations when breathing mindfully can be helpful? What else can help you to calm down? In the ‘Mind in a Jar’, feelings and thoughts were at the bottom of the jar. What else is there in our minds? Note: You will also find longer videos on mindfulness with this clip embedded. Some illustrate the ‘mind in a jar’ activity with a real group of kids choosing and adding their own coloured sand. Got up early on Saturday morning, and here is the reward! The video sends a clear and mindful message in simple but effective language. I like the ‘show & tell’ post-viewing activity, which for me is a great way to do the drilling! Thank you very much! I tried this out with my English teacher trainees last week. The main topic of the lesson was “Integrating the four skills in ELT” and I used this as a warmer. First, I asked everyone to say what kind of mood they were in. There were a lot of words coming up like tired and sleepy (this was on a Thursday morning). Then I gave them the title of the clip and asked them to predict 10 words they expected to hear. Although I tried to help, they were puzzled and didn’t have too many ideas. When we watched the clip, I didn’t manage to stop the video after “pick a color” as the IWB didn’t want to cooperate with me. Also, as we were listening, they were reluctant to breathe and just smiled when I did. Before a second listening, I gave half the group the first part of the script and the other half got the second part. And we did the echo istening so that they were actually reading out the text with the narrator. Then we talked a little bit about how a teacher’s mood influences the mood of the learners and the atmosphere during a lesson and how important it is to create an atmosphere in the (language) classroom where learners feel there is trust, acceptance and cooperation so they become motivated to communicate in a language they don’t speak well about topics that they may not know much about. Finally, we discussed how many and what types of skills and sub-skills were integrated in this activity and how it could be followed up with some reading and writing. Despite my students’ initial reluctance to play along, I feel the activity worked very well in the end, and I saw that many of them were taking notes and became interested in further e-lesson inspirations, too.